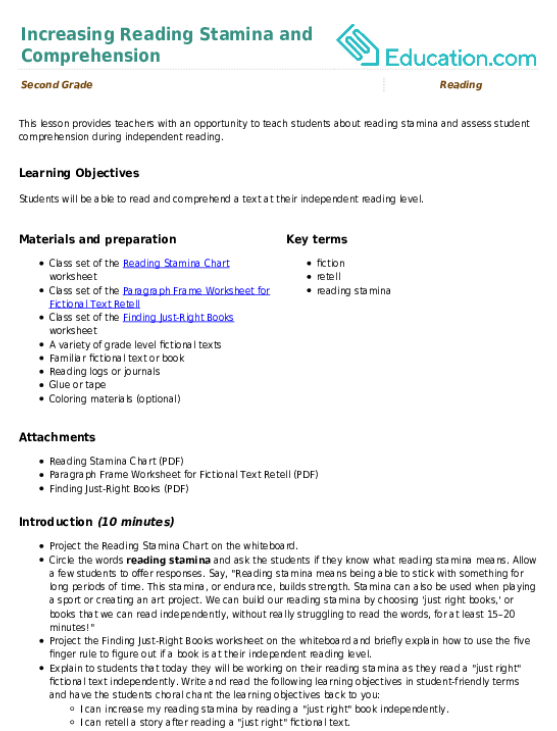 This lesson can be used as a pre-lesson for the Goldilocks and the Beginning, Middle, and EndLesson plan. 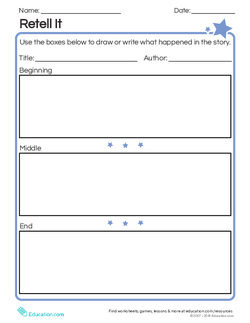 Students will be able to retell a narrative and identify the beginning, middle, and end of a story. 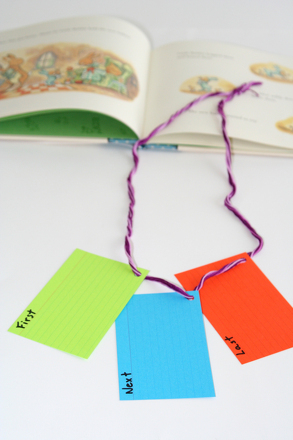 Students will be able to describe parts of stories in a sentence level context using sentence frames as a support. Hold up a book that you have read as a class. Call on someone to briefly retell the story. Tell students that stories have beginnings, middles, and ends. Retell what happened at the beginning, middle, and end of the story. Tell students that they just told what happened in the book using their own words. This is called Retelling. Repeat that stories have beginnings, middles, and ends. BeginningsHappen first, MiddlesHappen next, and EndsHappen last. "This story is about ____." Hand out the Retell It worksheets. 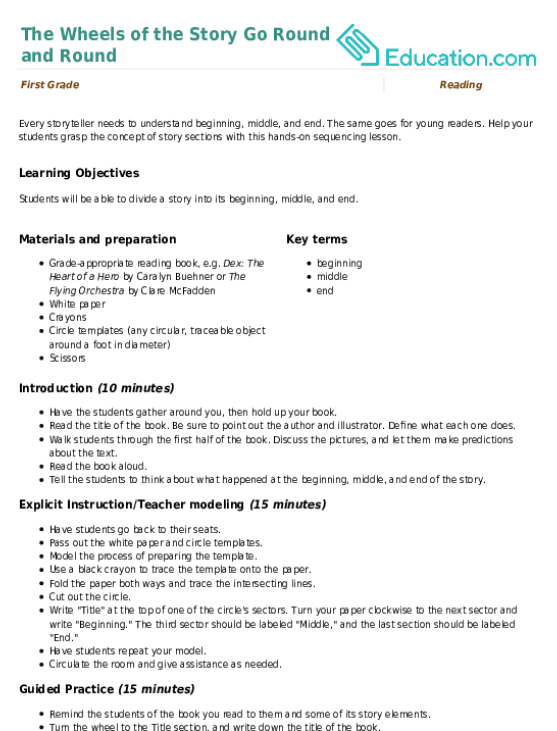 Tell students that they should draw what happened at the beginning, middle, and end of their book. They can add words/sentences if appropriate. Have partners share the work they did on their worksheets. Have students only draw about what happened. 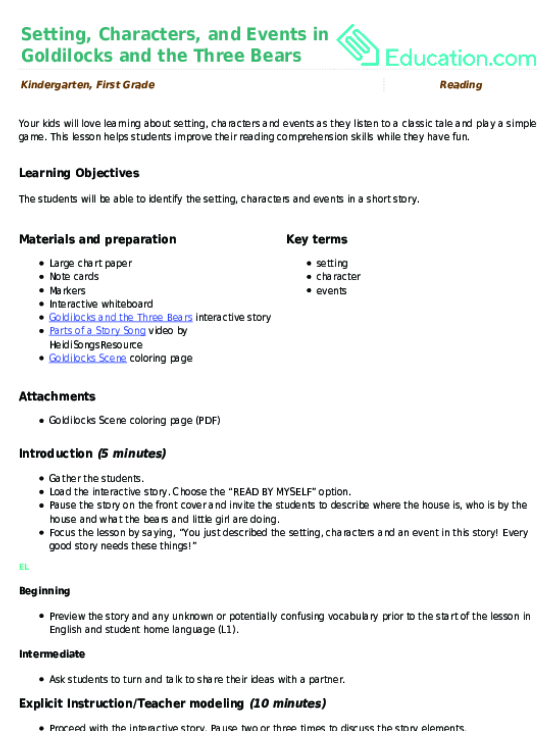 Have students share details about each part of the story on their worksheets. Challenge students to share those details when working together with a partner. How do we retell a story? "We retell a story by ____." 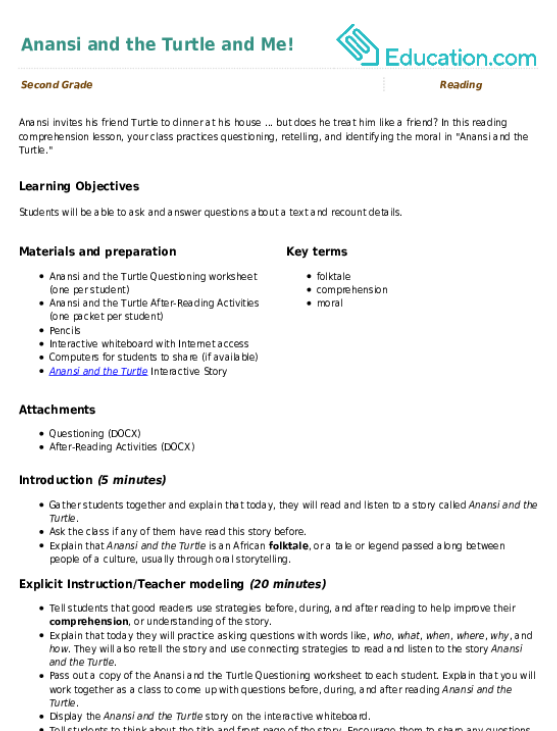 What parts of a story do we include in a retelling? Call on pairs to share what happened at the beginning, middle, and end of their stories. 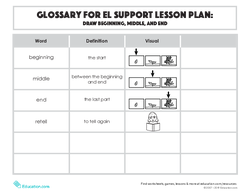 Use this glossary with the EL Support Lesson Plan: Draw Beginning, Middle, and End. 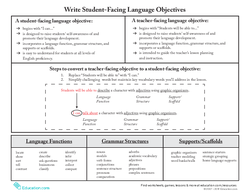 This lesson can be used alone or with the Goldilocks and Beginning, Middle, and End lesson plan. 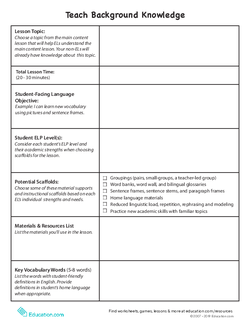 Use these vocabulary cards with the EL Support Lesson Plan: Draw Beginning, Middle, and End. 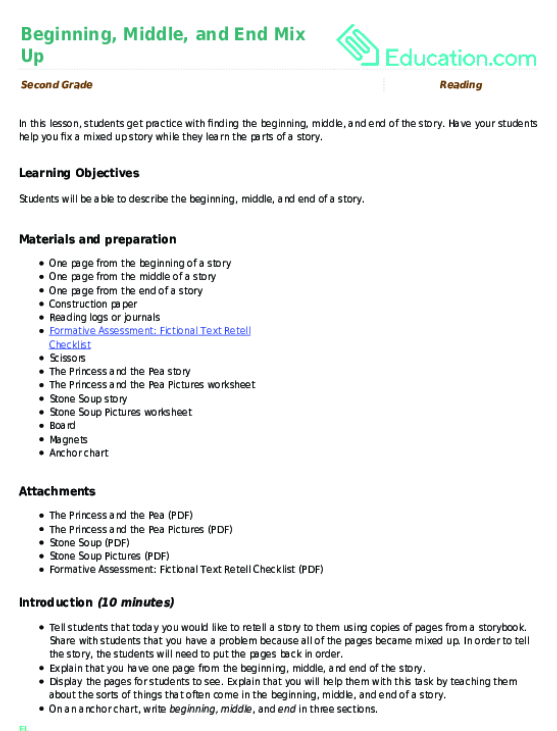 Students will share important details from the beginning, middle, and end of the story. 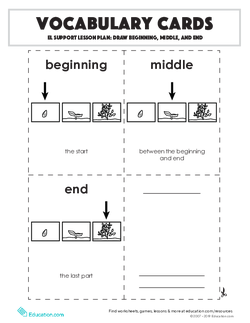 Make sequencing stories more interesting than just beginning, middle, and end! 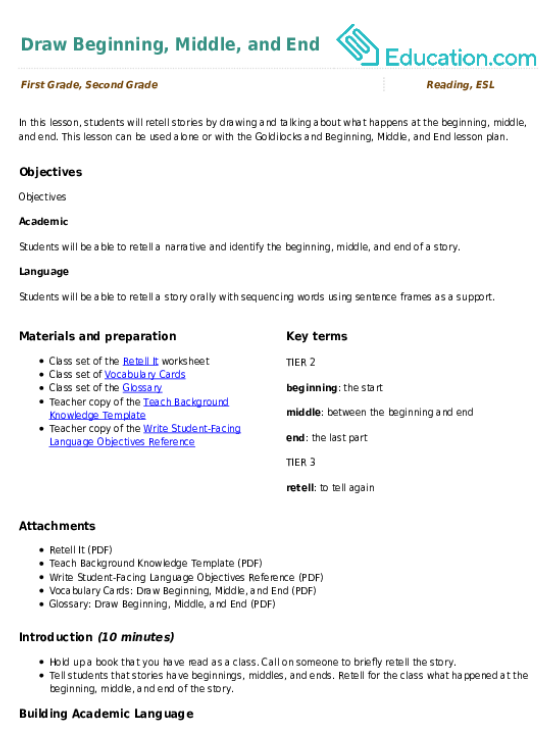 In this reading comprehension lesson, your class practices questioning, retelling, and identifying the moral in "Anansi and the Turtle."